Recently I was in a discussion with a few local pastors, one of whom volunteered that his church had intentionally cut back on its frequency of observing the Lord's Supper because it alienated people who were not yet Christians and who were seeking to learn more about the faith. Like baptism, the Lord's Supper is a sacrament. A sacrament is not primarily something that we do to express our testimony. Regrettably, that's what many believers think. But the Bible teaches that a sacrament is primarily a visible, tangible affirmation to us from God himself. God appends the sacrament to his Word in order to reinforce his gospel message. It's a sign that symbolizes the gospel, that makes the Word "visible." 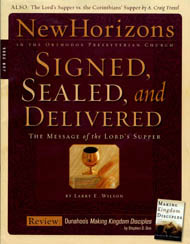 It's a seal that assures believers that God himself stands behind his promises. It's a means of grace through which God actually delivers Jesus Christ and his benefits to his elect by his Holy Spirit and through faith. What does God call to our attention by the Lord's Supper? In 1 Corinthians 11:17-22, Paul rebukes the Corinthians for setting up a distinction that God had removed among the people of God. That is why Paul cannot commend the Corinthians in their observance of the Lord's Supper (vss. 17, 22), as he can in general (11:2). In his reprimand, Paul tells this congregation that it would be better if they did not meet at all. When they gather together, "it is not for the better but for the worse" (vs. 17). At the General Assembly in 1837, the Old School party of the Presbyterian Church, U.S.A. pushed through a motion that abrogated the 1801 Plan of Union (see part 5 of this series) and declared the Western Reserve region of the Presbyterian Church to be "no longer a part" of the denomination. This area included presbyteries and synods in New York State and the upper Midwest (primarily Ohio). Twenty-eight presbyteries, 509 ministers, and 60,000 church members were removed from the church. I am the battalion chaplain for 1st Battalion, 46th Infantry, stationed at Fort Knox, Kentucky. This is a battalion of the 1st Armor Training Brigade. For a while, each of our four companies was running about 220 privates through a nine-week basic training course. Now, I am the chaplain for over 1,000 soldiers. Aside from the privates (recruits) who are in training, my battalion also has about 120 permanent-party soldiers, composed of our command staff, supply sergeants, drill sergeants, etc. After nearly seventy years of work (on and off), the Orthodox Presbyterian Church finally has a printed edition of its Confession of Faith and Catechisms, with all its General Assembly-approved proof texts written out at the bottom of the page (actually, filling most of the page!). Here is an account of the history behind these documents.